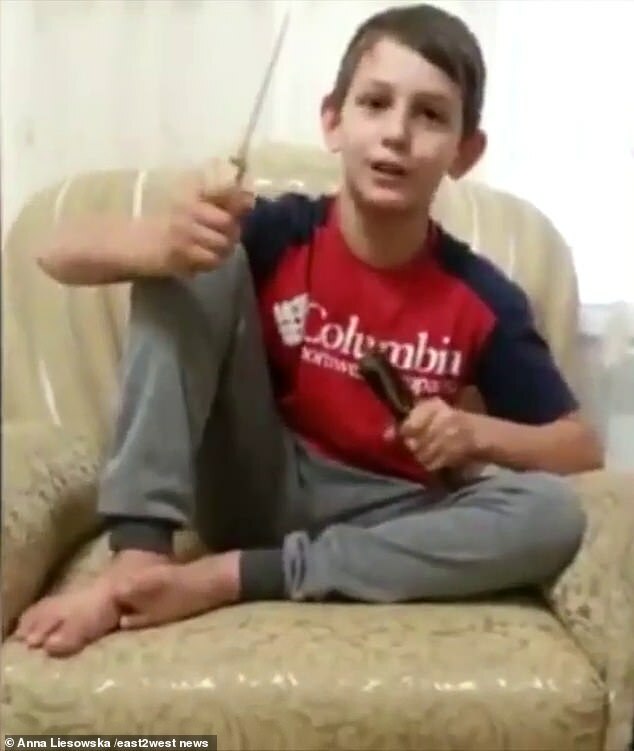 A chilling ISIS video has emerged showing an 11-year-old boy threatening to cut off his enemies' heads before he and his brother rammed a car into cops in Chechnya. The child, and his 17-year-old brother Elakh were shot dead by police a short time later having rammed a Mercedes into police in the capital Grozny. Dramatic CCTV footage shows an explosion as the car, driven by Elakh Akhmatkhanov raced towards a busy intersection. It then sped around a corner -hitting and killing a policeman - and crashed into a police vehicle injuring three others including a woman. The boys were shot by police seconds after the rampage - with officers apparently not realising the attackers were youths. The attack was in August but the video - highlighting the sickening use of children by ISIS - has only now emerged in Russia. The car attack instantly killed the policeman. A bomb device - controlled by the 11-year-old - exploded sooner than expected in the car, but did not kill the brothers. This was one of a series of attacks staged by male cousins aged from 11 to 18 on August 20. A family member later said the boys has been 'zombified' by ISIS. He warned that ISIS had 'gotten to the children'. He asked: 'What can you say to a mother whose sons were killed at same time, who knows that neither one will come back? The cases highlight the threat of 'child terrorism' in Chechnya, a region of Russia hit by two wars since the breakup of the Soviet Union. Chechen leader Ramzan Kadyrov, appointed by Vladimir Putin, claimed the attacks were aimed to 'create an illusion that there are some forces capable of organising armed actions and terrorist attacks' in his region. Despite strongman Kadyrov appearing to control the region, Ekaterina Sokirianskaia, director of the Conflict Analysis and Prevention Centre, has said: 'We are seeing the rise of a new generation of Chechen jihadists. Other attacks the same day involved an alleged suicide bomber, a policeman killed by firearms, and another checkpoint attack.